Fancy Nancy meets Stage School in this adorable illustrated junior fiction series, starring Lily D! Romeo and Juliet, from Shakespeare's play, were madly in love, but couldn't be together. TRAGIC FACT! So when Lily D trains for the role of Juliet, she tries to learn what it's lik... read full description below. Fancy Nancy meets Stage School in this adorable illustrated junior fiction series, starring Lily D! Romeo and Juliet, from Shakespeare's play, were madly in love, but couldn't be together. TRAGIC FACT! 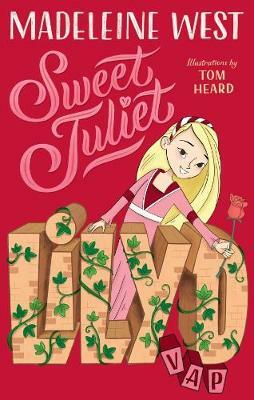 So when Lily D trains for the role of Juliet, she tries to learn what it's like to love someone you're not supposed to. She saves a star-crossed friendship, learns about real loyalty, and even walks in another character's shoes. But can Lily D figure out whether true love really can conquer all? -------------------------------------------------------------------------------------- Lily D is a jump-off-the-page character who is full of beans - which is good news because she is very busy! She does ballet on Mondays, tap on Tuesdays, acrobatics on Wednesdays, singing on Thursdays, and drama on Fridays. Drama is her favourite! It's Lily's dream is to become a performance artiste when she grows up. Lily D thinks of herself as a VAP (a Very Amazing Performer). But Lily is no child star, she understands that success requires hard work and respect, neither of which can be achieved overnight. In each book in the series Lily `goes method' to inhabit a theatrical character and learns something about the lives of others and her own along the way. Lily is gleefully bold, charmingly flawed and feels totally believable. She looks for the positives in everyone and anyone, and celebrates them! She is loyal, funny, kind, and though becoming different characters can wreak havoc on her world and everyone in it, Lily always learns something from the experience and always strives to treat others with kindness and respect. Madeleine West is an actor who has been the star of some of Australia's most popular dramas. She commenced a degree in Law, before deferring her studies indefinitely to turn to acting. She joined the cast of Neighbours in 1999 and the rest is history. Most recently starring in Zoe Foster Blake's The Wrong Girl, Madeleine will be returning to screens this year on Channel Ten's newest sensational series Playing for Keeps. Madeleine is the mother of 6 children under 10 years of age with her partner Shannon Bennett.